States cannot deliver the essential ingredients of health care reform effectively if a national positive outcome is desired. That is why state-like co-ops, a gentle sounding word identified with rural electrification at reasonable rates or bulk food purchasing for poorer families, isn't a solution. The two examples given are both less complex challenges and not all encompassing endeavors. 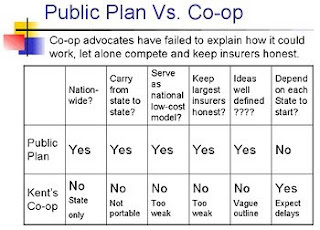 The co-op approach is really just another means to dilute the effectiveness of a public option, which was a compromise to single-payer, to benefit the insurance industry. It is a case of divide or multiply and conquer. Senator Jay Rockfeller has the right instincts on this Trojan horse reform killer.